First- and Second-Year Experience’s (FYSE) annual service program, Sophomore Days of Service (SDoS), celebrated its seventh year of success this February. SDoS is a month-long service program that aims at helping students make a difference on campus and in the DeKalb community through the two-to-five hour, one-time volunteer experiences. This year, students volunteered at sites such as the Huskie Food Pantry, DeKalb County Rehab and Nursing Center, Raven’s Husky Haven and the Heartland Blood Center. 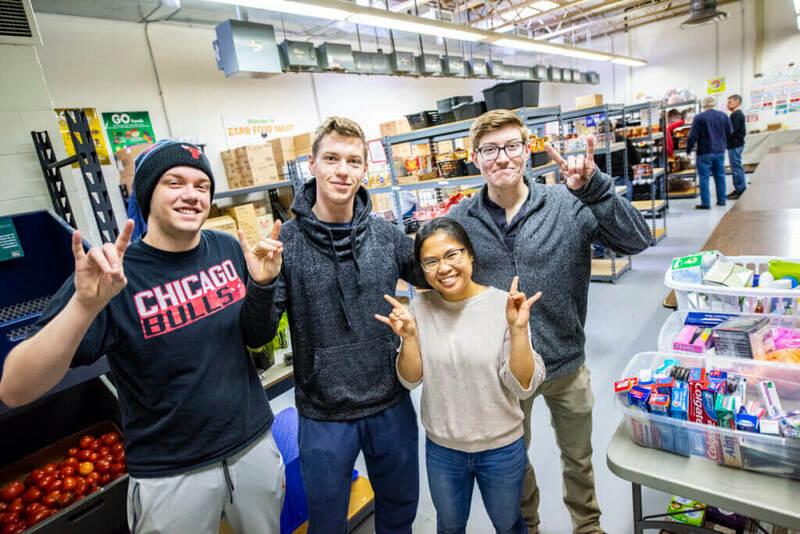 NIU volunteers help stock shelves in the Barb Food Mart, a community food pantry, during the Sophomore Days of Service. SDoS soared to new heights in 2019 with around 88 student volunteers serving at nine different volunteer locations, with many students volunteering at multiple sites. A total of 328 volunteer hours were completed by NIU students, some contributing to cleaner facilities at Raven’s Husky Haven, positive interactions between children and NIU students at the West Elementary School Fun Fair and approximately 14 pints of blood at the Heartland Blood Center blood drive. Each volunteer experience begins with a quick orientation to the volunteer site and ends with students reflecting on their time volunteering. A student volunteer at DeKalb County Rehab and Nursing Center remarked, “I came for my friend because it isn’t something I would normally do, but I will definitely do similar things in the future.” FSYE plans to improve and expand SDoS each year and encourages NIU campus partners and DeKalb community organizations to get involved. Each year, as part of Sophomore Days of Service, FSYE in collaboration with the Heartland Blood Center offer a scholarship for participants of the month-long event. Felipe Dominguez was picked from a pool of applicants for their numerous volunteering opportunities with DeKalb County Rehab and Nursing Center. On behalf of FSYE we want to thank all who volunteered and made SDoS 2019 a success!